Our organ is a 3-manual digital instrument manufactured in Italy by Generalmusic SpA, a company with a musical history dating back to 1890. 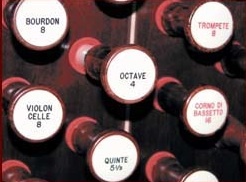 To access the various organ sounds, the AG3200 has 62 primary drawknob stops, each of which has 3 to 8 sub-stops with variations of the main sound, or sounds of a similar type, giving the organist a choice of 376 possible sounds. In addition to the wide variety of traditional organ sounds, there are stops for chimes, harp, piano, harpsichord, timpani, and acoustic piccolo trumpet, among others. The realistic pipe organ sound is achieved by digitally recording selected pipe ranks of a variety of pipe organs around the world, pipe-by-pipe, on-site, in their natural acoustic settings. Sound engineers reproduce the actual pipe sounds and store that information in the organ’s memory so that it can be played back digitally at the organist’s touch. Sixteen audio channels—in our installation there are 12 speakers at the front of the sanctuary and 4 at the rear, near the ceiling above the balcony—create a complex and visceral organ presence.